Hello Friends… Today we teach tou ” How to Remove Shortcut Virus from USB and PC ” when you insert your USB/Pendrive in your Computer you see Automatically create a ‘Shortcut’. This shortcut is virus. When you copy Data Computer to USB OR USB to Computer, this virus Automatically Create Shortcut and Currupt your Data. Step 1. 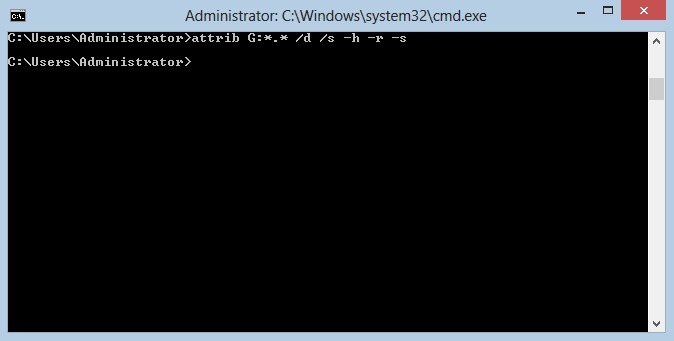 You easily Remove Shortcut virus with CMD Command. Insert Pendrive/USB in PC. Step 3. Now wait until the command finish. After this Process Complete Shortcut virus Removed from USB and PC. We use third party software for Remove Shortcut Virus from USB and PC. Malwarebytes find and Remove many Common infections. This software scan your USB & PC and Remove malwares.this software give complete security of PC. You easily Remove Shortcut virus from USB and PC with UsbFix Software. We Recommend you Download and use UsbFix Software. This software Specially for usb Protection only. Cleaning :- UsbFix Remove Junk and Shortcut virus from your External Hard Drive. Repair :- this Software Repair file (Damaged by Virus). Backup :- When UsbFix Software delete your damage file from USB. UsbFix Create Backup of all damage file. You easily Recover files any time. Thank You for Reading. If this article Helpful for you and you like this article, please share with your friends and read other like this article.